Just beside the world-famous Long Bar, birthplace of the Singapore Sling, Long Bar Steakhouse continues the colonial heritage of Raffles Hotel with its warm, teak furnishing and gourmet steak delicacies. 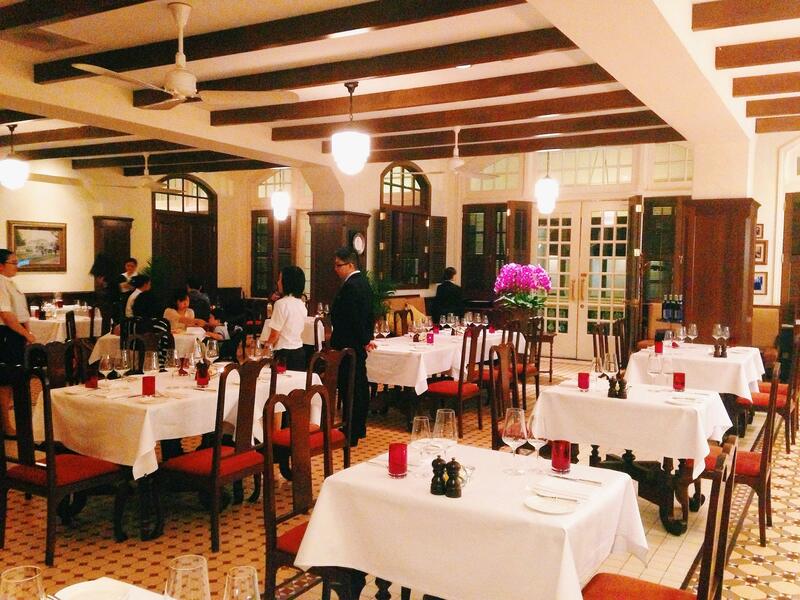 Long Bar Steakhouse gives off the scent of ‘old money’, a place for the upper-class to gather for fine-dining in Singapore. Start off dinner with an appetizing bottle of Billecart-Salmon Brut Reserve ($38/$148) Champagne, exclusive only to the Raffles group of hotels. 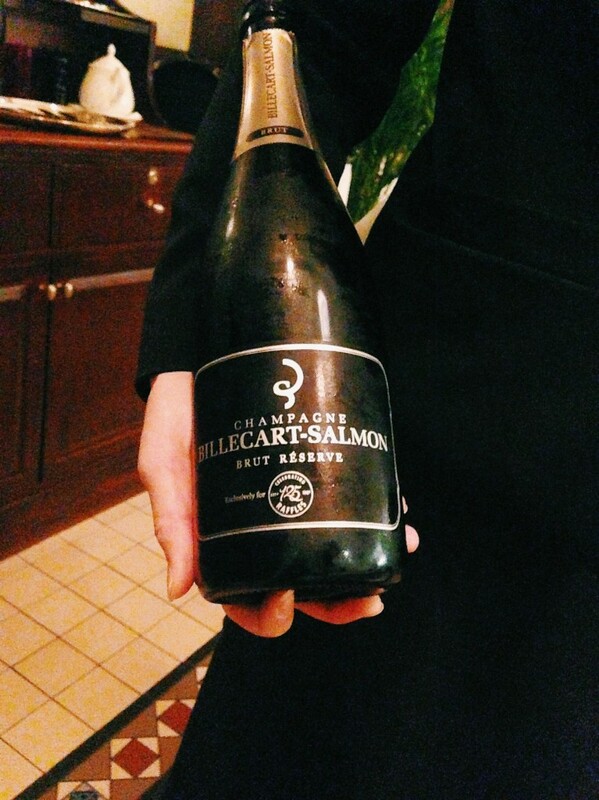 A blend of Pinot Noir, Pinot Meunier and Chardonnay, the Billecart-Salmon brut is fruity, approachable and overall very easy to drink. Served in a wider white wine glass instead of a flute, this allows a better nose of this Champagne’s fragrant aroma. 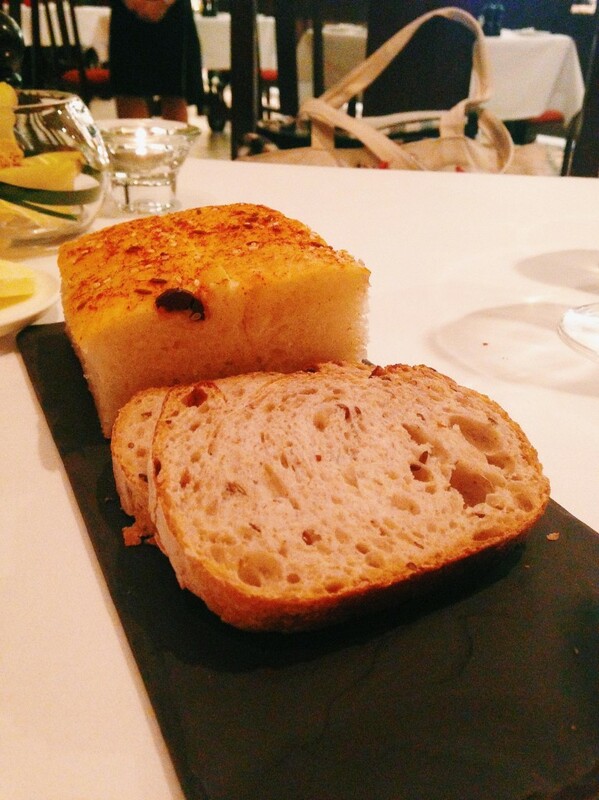 Cumin Focaccia bread, a fluffy bread starter with orange scents and the soft hint of sesame. Good bread is always a must to start off a good dinner. 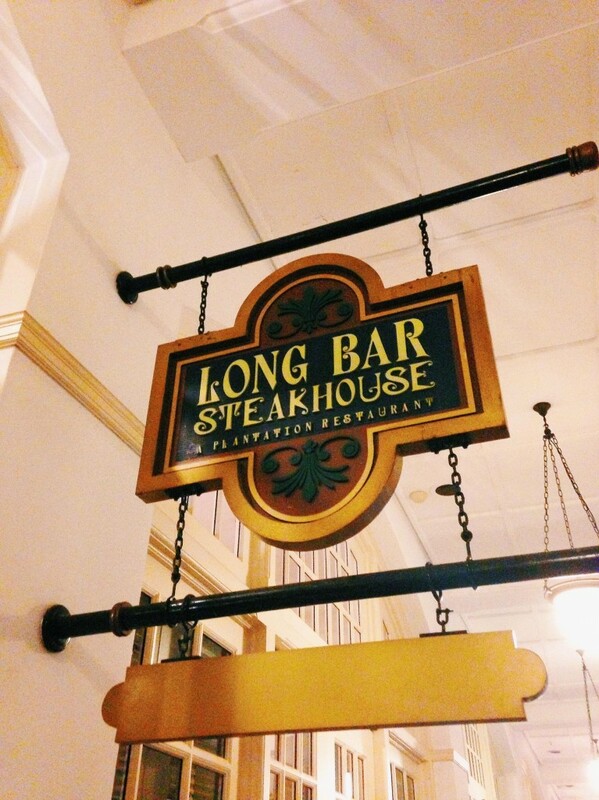 Long Bar Steakhouse Sampler ($42). 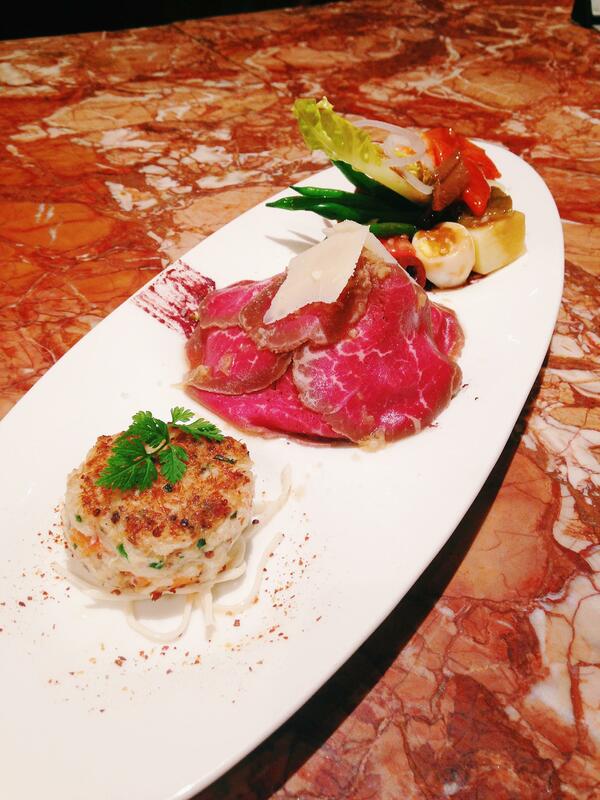 Dungeness Crabcake with Celeriac Remoulade, Omaha Beef Tenderloin Carpaccio Parmesan, Tiger Prawns “Nicoise” Vegetables. The crabcake has a subtle spicy kick from the Espelette chili which compliments the sweetness of the Dungeness crab meat. The Carpaccio was extremely tender and presented very basic with little additives other than the parmesan; I love that it wasn’t overpowered by dressings. Absolutely delicious Carpaccio which lets the beef shine. Escargot with Garlic Butter ($40). 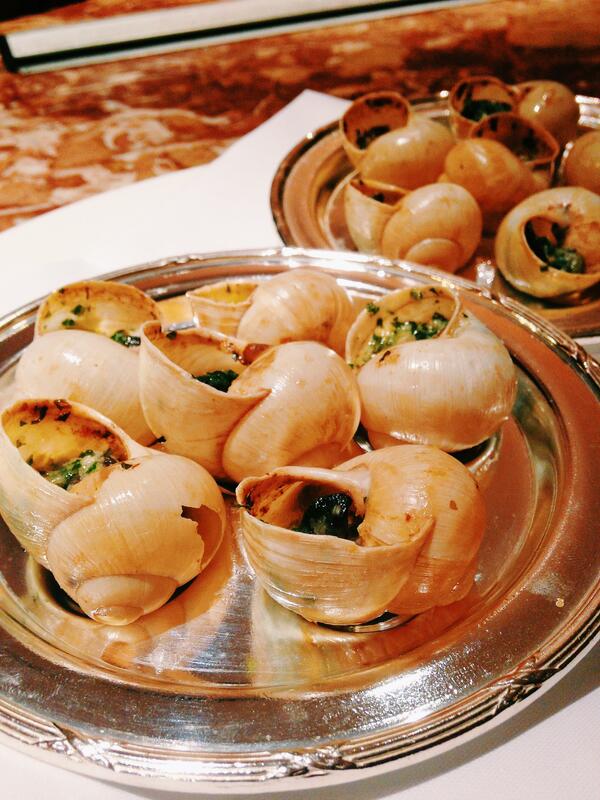 A dozen firm, yet juicy escargots simply baked with garlic butter to showcase the quality of French Burgundy snails used. 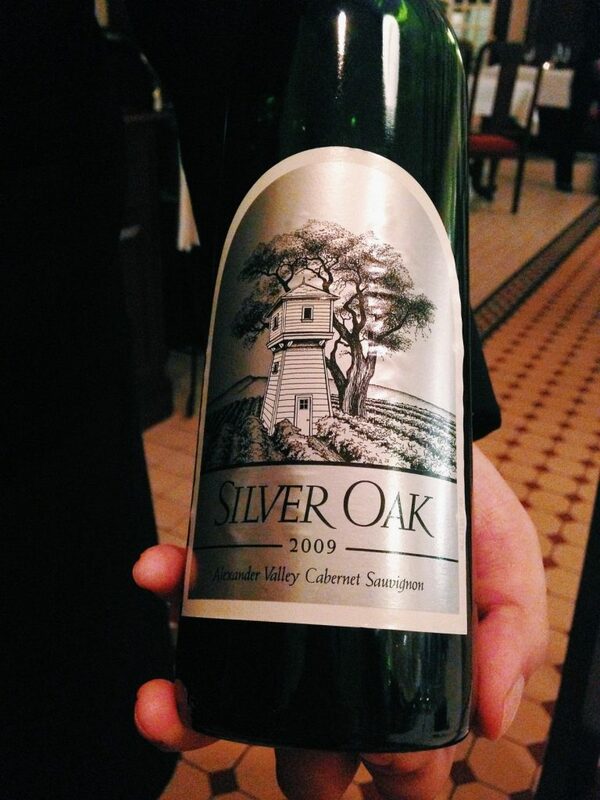 To pair with the upcoming heavier flavored steaks, the Sommelier recommends the Silver Oak, 2009, from Alexander Valley. More complex with plum notes and a little oak aftertaste, its soft and gentle body is due to the vineyard’s cooler climate near the coast. 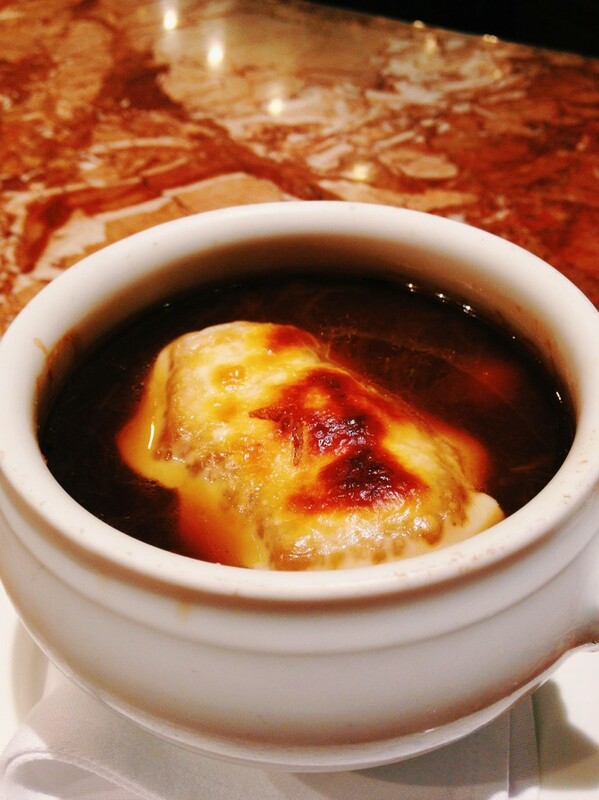 Onion Soup ($25). Comes with Emmental cheese toast. Personally not a fan due to the heavy veal and red wine stock, but lacking in sweet onion flavour, which makes the soup a bit repetitive after a few more sips. A touch of bitter aftertaste as well. 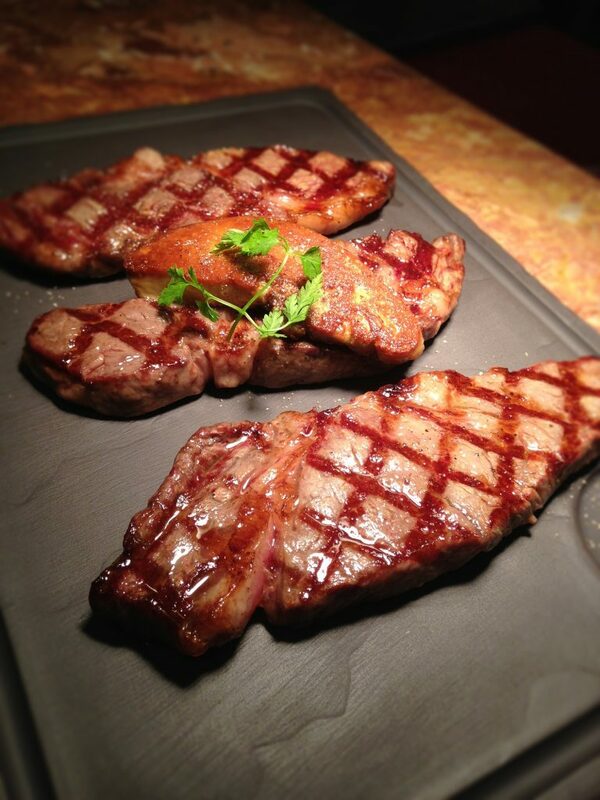 Tasting of Rib eye ($178) with Foie Gras ($25). Australian Angus 200 day grain-fed Victoria State (120g), USDA Prime, Great Omaha (120g), Australian Full blood Wagyu Mayura Station (120g). The best way to have a good variety is to go for the tasting plate. I liked the Australian rib eye cut best, but found the sides of the steaks a bit dry, which got juicier towards the middle. Perhaps due to the thin nature of the steaks, the doneness was not as even as the steak continues cooking quickly even after taking off the grill. Still highly flavorful and juicy, get this cut tasting if you prefer more complex meats with intense mix of beefiness and fats. At this point the wine flavour was tasting more pronounced, as the fats from beef numbs the tannins from the red wine. 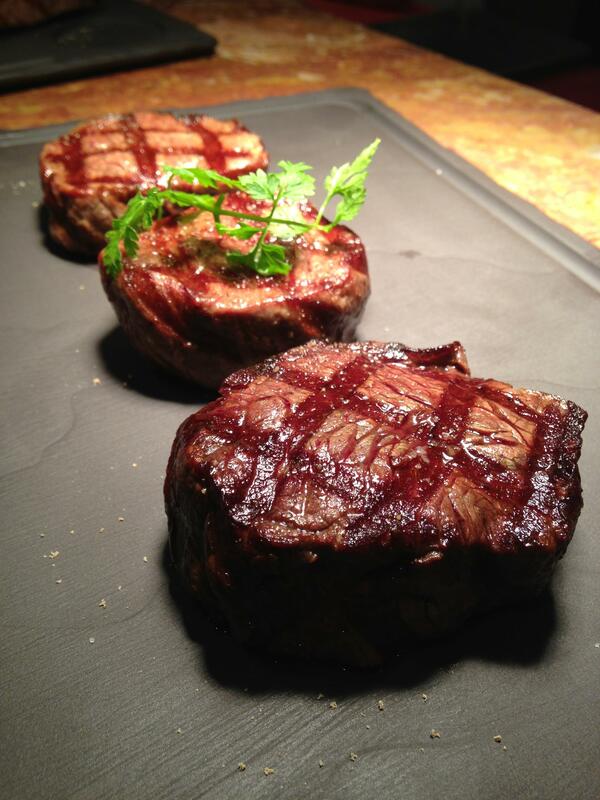 Tasting of Filet Mignon ($158). Australian Angus 200 day grain-fed Victoria State (80g), USDA Prime, Great Omaha (80g), Australian Full blood Wagyu Mayura Station (60g). A choice more popular with the ladies due to the leaner nature of the beef as well as a smaller portion. I liked the USDA prime better for the Filet Mignon tasting, which was tender with a slight charred finish. The Wagyu was juicy and balances the lack of fat in this cut as well, but nothing too extraordinary. Tastes like a marbling score of 7. 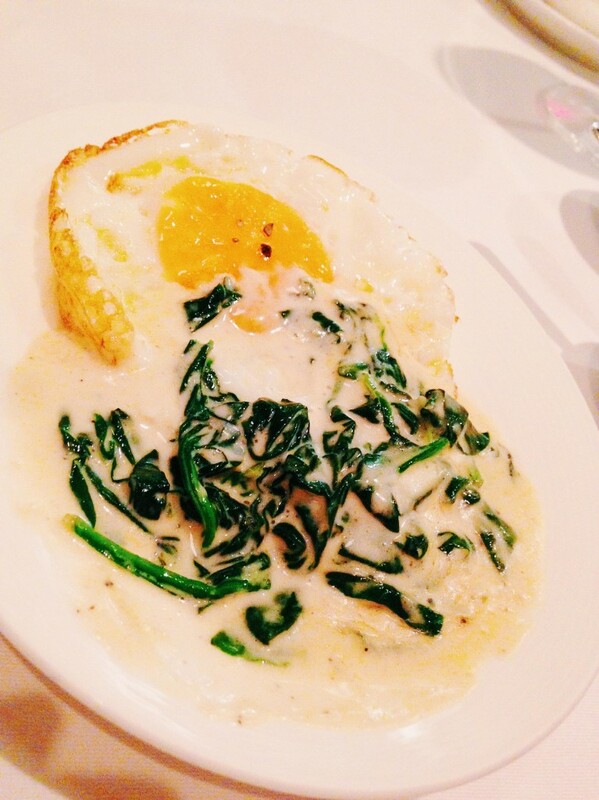 Sauteed Spinach with Cream ($9). Comes with a fried egg as well. Spinach was a bit bitter though. Selection of Sherbets ($16). Coconut and strawberry sherbet for the day, which were excellently smooth with minimal ice crystals. A tangy, sweet finish with fresh berries. 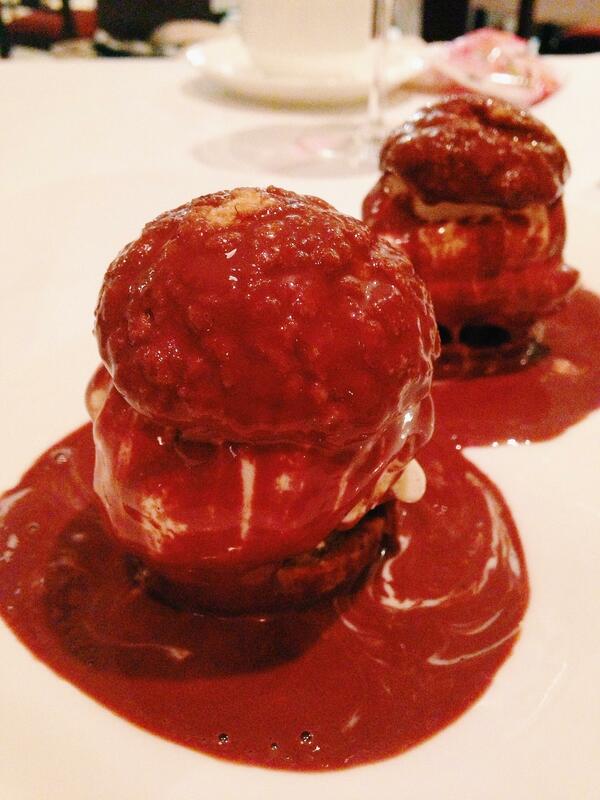 Chocolate and Vanilla Profiteroles ($20). Cocoa nibs crumble, vanilla ice cream, dark chocolate sauce drizzled on top. A very good dessert with milky chocolate seeping into the profiterole puff, combining with the vanilla ice cream and cocoa nibs for a multi-textural bite. 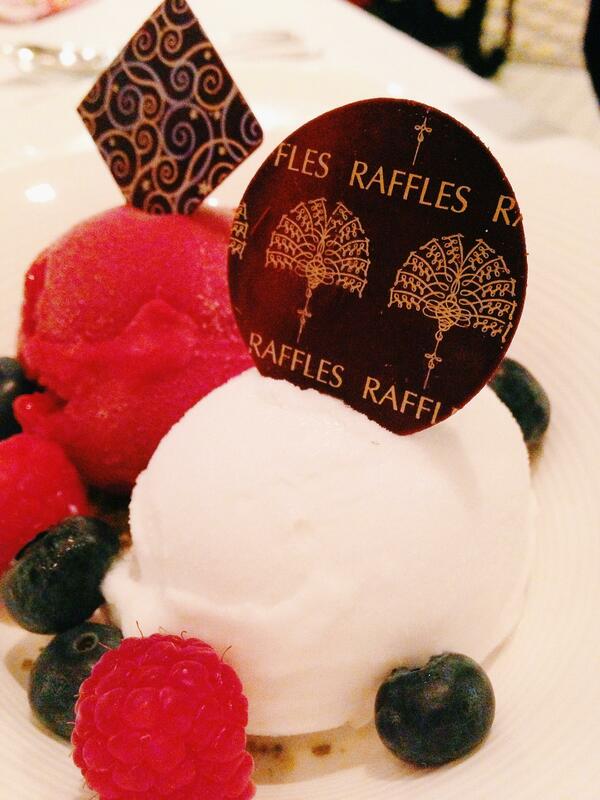 Be dazzled by the informative and attentive service by the Raffles crew, who have delighted me since my review on Bar and Billiard’s Sunday Brunch. Enjoy a leisurely-paced, fine-dining experience with dish by dish anticipation at the exquisite Singapore Raffles hotel.